Wedding season is here! The most popular time to get married is fast approaching, making this the perfect time to start looking at wedding cakes, and figure out what is the best wedding cake for you. Here in London there are various locations available, from flowery gardens to contemporary skyscrapers, with cake designers happy to match whatever style of wedding you are going for. It’s hard to know what you want if you have no idea what options are out there, which is why here at Elegateau Cakes, we’ve put together a list of the most popular styles out there, helping you choose the right cake style for your wedding and a cake we would love to make for the happy couple. If you’re a traditional couple, then you’ll probably want to stick with a traditional cake. If your heart is set on a classic church wedding with all the features of a conventional wedding day, then your cake can help add to this aesthetic with a white tiered wedding cake featuring some delicate decorations. A popular way to match a cake to your traditional wedding dress is have some sugar flowers on the cake that match your bouquet. Just bring us a picture or a live example of the flowers you will be using, and we’ll be happy to recreate them for you! As experienced cake designers, we will skillfully duplicate an aspect of your dress, such as the lace detailing, onto your wedding cake. If you are in search of something more modern in style, then a contemporary wedding cake is perfect for you. This style adapts the ideas of a traditional wedding cake but adds a modern twist, this being done with the addition of new-fashioned designs or by changing the shape of the cake. You’ll may want to stick with the tradition of having a typically tiered cake, but who says you can’t change it up a little bit? Why not create a modern twist by inverting the cake, and using a square shape to add that modern, geometric feel? 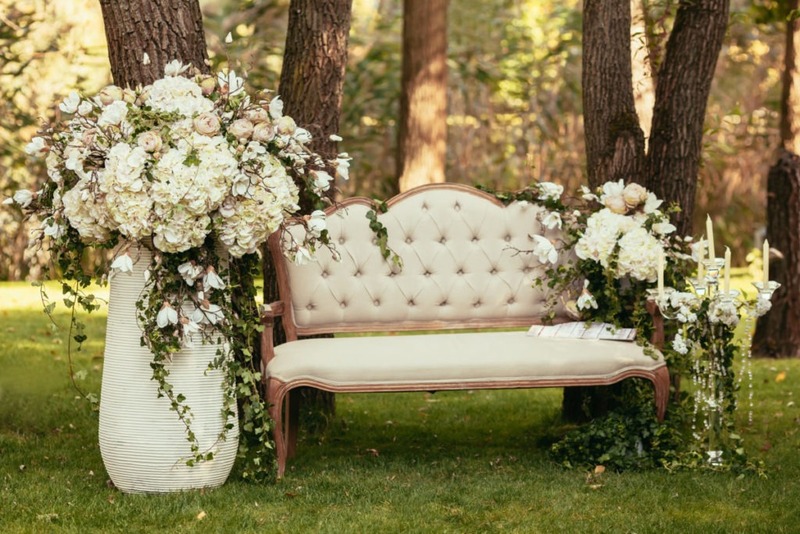 This is sure to wow your guests and be a great addition to a wedding that has a more modern feel. If your wedding is in a barn, the woods, or anywhere involving nature, then a rustic wedding cake is what you need at your reception. This style of wedding cake is all about looking natural, with no need for bold colours of icing covering the cake or details such as shimmery rhinestones. Instead you can stick to a more natural ivory coloured cake with details of flowers, fruit, and rustic chic buttercream designs to reflect the style of your wedding, allowing the ethereal yellows and oaky browns to come through. You may even go for a naked wedding cake, a new style taking over the wedding world that features no exterior icing, the piece is instead complimented with details such as flowers, fruit or edible leaves as delicious decoration. As the perfect finishing touch, you can place your cake on a stand made from a tree stump, or feature cake toppers that represent your love for a rustic, natural environment. If you and your partner are going down a quirky route, why not celebrate that with a novelty cake? This, of course, can still follow the wedding cake style while also celebrating something you both love! Maybe you both are big fans of Harry Potter and would like a few aspects of this sprinkled throughout your wedding, then why not incorporate this into your cake? You could feature cake toppers that have a distinct wizardry look to them as a delicate feature or go all out and style the entire cake in the shape of the sorting hat. The world is your oyster! Let us know what your ideas are and see what designs we can come up with together. Show your style by having a colourful wedding cake at your reception. You can feature colour in a variety of ways, one of these could be the use of your favourite bold colour as your base colour. 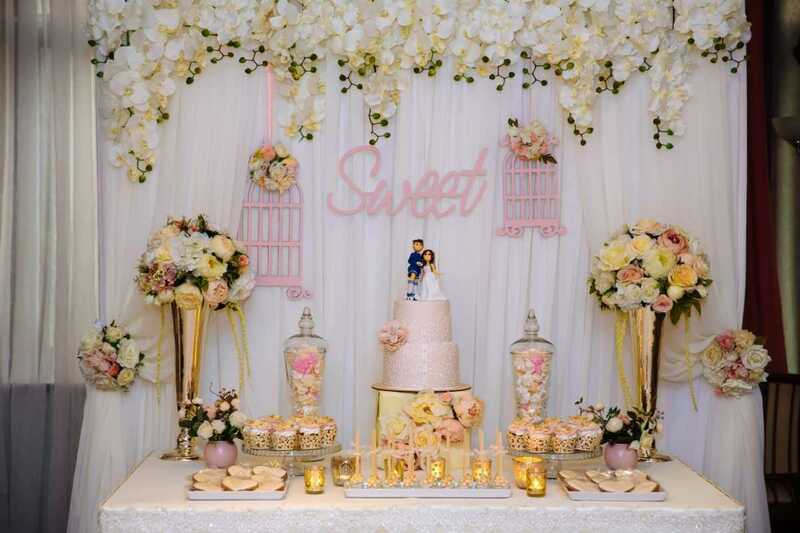 This can then be built on with wedding cake decorations, such as flowers or piping details. If you still want to stick to the traditional base colours, then instead focus your colours on the extra details! You can have boldly coloured flowers or go all out and feature polka dots or stripes in a variety of colours all over your cake. If you’re sticking with a tiered cake you could have a different colourful pattern on each one. This is perfect for couples who are all about sharing their fun side. Not only are metallics a big deal in fashion right now, they have also made their way to wedding cakes. Metallic details are perfect to brighten your wedding up, showing a different side to wedding cakes without having to be extrovert with a bright colour. If you are going for more of an elegant vibe but still want a wedding cake with a punch, then this is the way to go. You will be grabbing your guests’ attention with a cake people will remember. Regal gold and bronze metallics are perfect for an autumn wedding. You can further create a cosy yet majestic vibe by incorporating these metallics not only into your cake, but also other parts of your wedding. If you’re ready to talk about your ideal wedding cake design, contact us now! We pride ourselves on creating beautiful works of art for the people of London, and we are more than happy to make any style of cake mentioned above, as well as anything else you could possibly think of.